If you import data into Excel, some of the numbers might have a minus sign at the end of the number, instead of before the number. That data will be treated as text, instead of numbers, and won't show the correct total, if you use the SUM function. You can fix those trailing minus signs manually, but if this is a frequent problem, use the following macro to fix all the trailing numbers on the active worksheet. The code helps ensure that you don't accidentally process any text cells containing delimiters from a previous use of the TextToColumns feature. It also protects against there being an empty column within the UsedRange. When you're working with Excel VBA, you might want find the last row with data on a worksheet, so you can paste new data in the row below that. Some methods, like the line of code shown below, can cause unexpected results in there is an Excel Table on the worksheet..
To prevent problems, use the following line of code in your existing macro, to reliably find the last row. Note: This code ignores cells with formulas that are displaying the empty string. If you need to identify formula cells that might be displaying the empty string, then change the xlValues argument to xlFormulas. As an example, the LastRow code is in this short macro that displays a message box. When the GetLastRowWithData macro runs, a message box displays the correct number of the last row with data on the active worksheet. All cells between cell A1 and the last used cell are selected. Sometimes though, the selected range is bigger than expected. It might include cells that are empty, but formatted. Or the selected range could include cells where previous values have been deleted. The previous macro selects from cell A1 to the last cell that contains data. If your worksheet's data does not start in cell A1, and you really want the actual used range on the worksheet, then you can use the following macro. I graduated college as a Math Major and then ended up working for some 32+ years as a Civil Engineer (Road Design) for the New Jersey Department of Transportation. I originally started programming in BASIC on a Texas Instruments TI-99/4 as a hobby. Eventually I formed a company (FFF Software) with two other gentleman and we sold a couple of TI-BASIC programs commercially for a couple of years. I also sold several articles on programming the TI-99/4 to COMPUTE! Magazine. Once TI went out of the home computer market, I purchased a Radio Shack Model 100 (first truly portable computer) and programmed on it (again, as a hobby) for a couple of years. Again, I sold several articles to a couple of magazines that covered this particular computer. Before buying my first IBM compatible PC, I owned a Commodore 128 and Atari 520. Once I discovered Visual Basic, I was completely hooked. I continued writing articles on and off across the years, but now exclusively for Visual Basic; and, of course, I used Visual Basic in my workplace to make my job, and the job of my co-workers, easier. About a year or so before I retired, I decided to start helping others with their programming needs by volunteering to answer questions on various Visual Basic newsgroups. 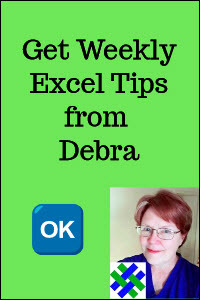 In 2007 or so, I branched out and began answering questions on Excel newsgroups as well. I have been retired for a few years now but my Excel (and now to a lesser extent VB) newsgroup volunteer efforts are still continuing to this very day.